Responsible Futures won the ‘Best First Time report’ award at the Association of Chartered Certified Accountants (ACCA) Sustainability Reporting Awards 2011 in Sydney. The ACCA Sustainability Reporting Awards were first established in 1991 and are given to organisations from around the world for excellence in environmental, social and sustainability reporting. The objective of the Awards is to identify and honour innovative attempts to communicate corporate performance. Green Gown Award ‘Continuous Improvement – Institutional Change’ La Trobe was recognised for the development since 2009 of its Best Practice Sustainability Governance and Management structures. The award outlined La Trobe’s, ‘sustained and successful activities to improve the sustainability performance over a number of years,’ and acknowledged the progress the University has made since the creation of its inaugural Sustainability Taskforce in 2009, to the appointment of Australia’s first Pro Vice-Chancellor (Sustainability) in 2010 and the release of its first sustainability report Responsible Futures in 2011. ‘Australian Environmental History: Gondwana to Global Warming’ is run by the School of Historical and European Studies in the Faculty of Humanities and Social Sciences. ‘Humans are part of nature, a fact that has often been forgotten under the influence of cultural ideas that place humans apart from or above the natural world’. 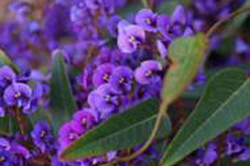 In this subject, students develop a critical understanding of environmental history; of environments as both naturally occurring and culturally constituted; of how nature and humans act on each other; and knowledge of the history of human and natural environments in Australia, from Gondwana to the present. They can pursue their own interests through a major research essay on some aspect of Australian environmental history. This subject is fully online, which means that students do not attend lectures or classes, but instead watch ‘lecturettes’ and participate in discussions online within allocated groups. In addition, there are short online quizzes, and synopses and research essays to write. The online format allows students at all campuses to enroll and the course currently attracts students from the humanities and the social and natural sciences. 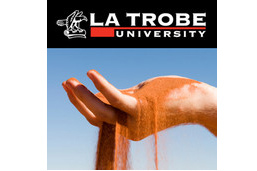 The subject is available as part of La Trobe University's free online iTunesU courses. In 2011, policy makers, resource managers and water users were faced with the huge challenge of managing our water resources, particularly in the southern Murray–Darling Basin (northern and central Victoria). Difficult trade-offs are required in the context of incomplete knowledge about water allocation benefits, supply variability and uncertainty under a changing climate. Research relating to water policy, water use and management has formed a significant part of the research activities of the Faculty of Business, Economics and Law. Thus, the Centre for Water Policy and Management was established under the Faculty in 2011, based at the Albury-Wodonga Campus. 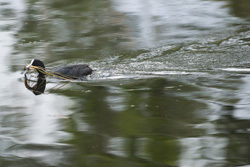 La Trobe University is well-placed both geographically and intellectually to carry out research and communication around water from our metropolitan and regional campuses. Our research ranges from historical archaeological studies of cultural landscapes of colonial water management to environmental flows, nutrient cycles, algal, fish and invertebrate ecology. Visit the Centre for Water Policy and Management website here. With assistance from the Packaging Stewardship Forum (PSF) of the Australian Food and Grocery Council, 134 new waste and recycling bins have been installed across the University's five campuses in Melbourne, Bendigo, Albury-Wodonga, Mildura and Shepparton. 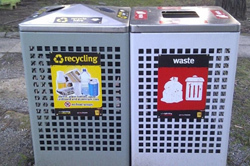 Each bin carries the call to action to Do The Right Thing, Use the Right Bin. The new systems will provide away from home recycling opportunities for up to 30, 000 staff and students and divert at least 140 tonnes of PET and aluminum cans from landfill each year - enough to fill almost 19,450 household wheelie bins.